You know how sometimes you're watching TV and the show is based in New York City and they get food delivered and... it's not pizza? And maybe you're like me and you live in the suburbs and pizza has long been the only delivery option around? Well, to be fair, we recently had a couple of Chinese places move in that deliver. But I dream of Thai and Indian and Greek. I even dream of Applebee's and Red Lobster and the local pub or local eatery. DoorDash is a service that has agreements with various restaurants. You go online, see what restaurants are available in your area, place an order, and a delivery person brings it to you. We decided to try it out last night. I will say that my greatest challenge was that I love international and ethical foods. My husband... not so much. 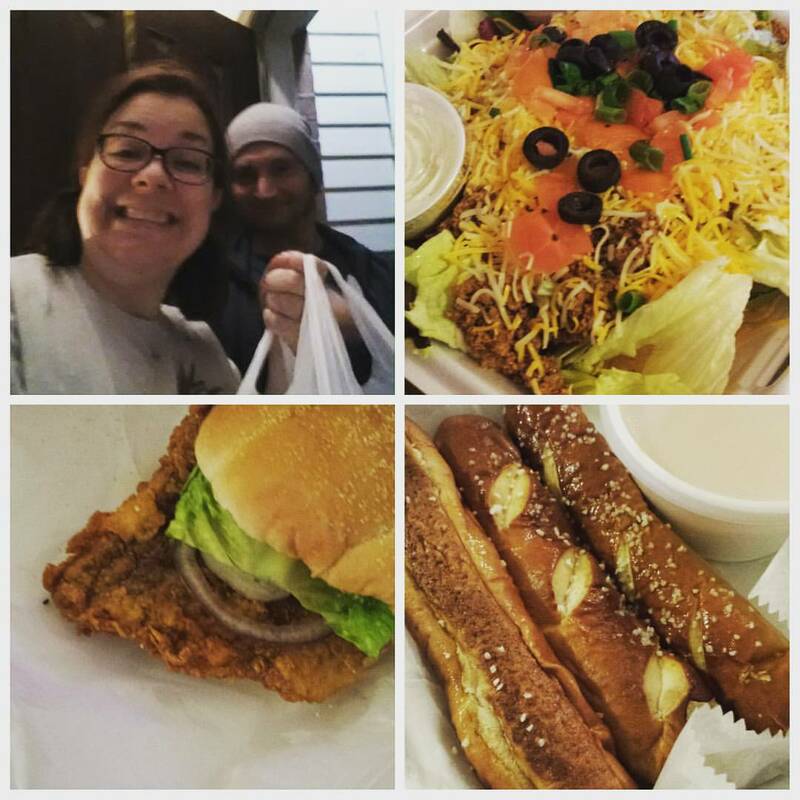 So for this first venture into the world of DoorDash, we went with one of our favorite local joints - Nickel Plate. 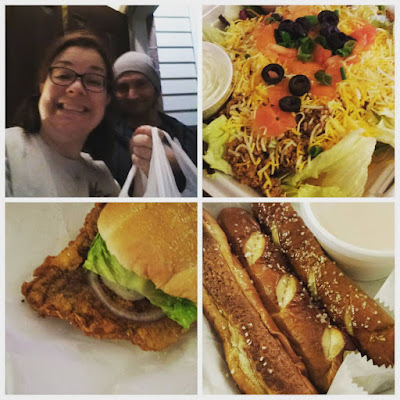 Every Hoosier has a heart for a tenderloin and my husband is over the moon that he can have one of his favorite tenderloins delivered right to our front door! There are times when Jeff is out of town and I long for my version of comfort food - sushi. But no place delivers! Now I have several options through DoorDash to have sushi brought to my house! DoorDash is really invested in helping local economies. This business not only supports local restaurants but also provides positive work opportunities for Dashers (your delivery guy). DoorDash is seeking to become international! They've just recently launched in Toronto. No - Indy peeps can't order from Toronto restaurants. And here is a SPECIAL OFFER for YOU! If you want to try DoorDash, sign up with my promo code EternalLizdom, and you will receive $8 off your first order. I was compensated for this blog post and social media efforts. However, all opinions are completely my own. DoorDash is a service I will use in the future! Thanksgiving is coming soon and my mom has asked me to confer with her on the menu. In recent years, I'v ebeen helping out with some of the planning and cooking. It's a bit of a challenge since we're 2 hours away by car but with a little planning, it's easy to make it work! Our family meal has scaled down over the years. It used to easily be 20 people. But family has moved away, families have changed, etc. Life happens. So now we should have 7 adults and 2 kids for our family meal. The must haves on our Thanksgiving table are turkey and my cranberry sauce. I love that my cranberry sauce is included in this must-have list. Cranberry sauce was never part of the meal when I was growing up. Sometimes the jellied canned stuff would appear but it wasn't required or missed. When I first moved away from home, I knew I wanted to contribute to the meal. I had also recently fallen in love with the cranberry sauce at Boston Market and I'd found a knock off recipe. It was fairly easy and it was GOOD. We also like easy when it comes to stuffing so good old Stove Top is on the table. Dessert is usually classics like pumpkin pie, pecan pie. And riots may break out if my mom doesn't make her very famous chocolate cream pie. Here are some favorite recipes and some things that I'm hoping to add to the meal this year. I'd love to know what you are planning for your holiday meal - and share what your traditions are (food and otherwise)! Are there any cultural foods that you include? I'd love to hear how your Italian or Polish or Mexican heritage plays in to your Thanksgiving planning. First and foremost - if you've never ever cooked a turkey in your life, I followed this recipe and it was easy and turned out great! And my 2 standard recipes - I've made these (more than once) and they are always a hit! Put jellied cranberry sauce in a saucepan. Add the marmalade. Heat on low (This will pop and spit and can make a mess!! Be sure it's on low heat and that you can stir often and feel free to cover it.). Chop the cranberries - food processor or blender works great. I also like to re-chop the walnuts to make the pieces more fine. Add the cranberries to the saucepan. The white inside part of the berry will start to turn more red. Add the walnuts. Stir, stir, simmer, stir. Once the cranberries are no longer firm, remove from heat, place in container, let cool, refrigerate. Preheat oven to 350. Grease bottom of 9x13 baking dish (I use my Pyrex). In large bowl, mix pumpkin, milk, eggs, sugar, spice, and salt. Pour mixture into baking dish. Sprinkle cake mix on top, evenly. Top with pecans. Drizzle with melted butter. Bake for 50-55 minutes. Let cool completely. Serve with whipped cream or topping. Deviled Eggs - There are lots of recipes out there for deviled eggs. When I make them, I do a portable version. I have a dozen hard boiled eggs. Then a gallon sized ziploc bag that contains: 1/4 c mayo, 1/4 c mustard (I use a blend of brown deli and yellow or a blend of dijon and yellow - I basically loosely follow this step and I add mayo and mustard as I feel like it). Peel the eggs. Cut in half lengthwise. Put the yolks in with the mayo/mustard blend. Mash the heck out of that ziploc bag until it's really well blended (great job for kids, by the way). Snip the corner of the bag and pipe the yolk mixture into the egg white halves. Sprinkle with paprika. I also like to have a hearty breakfast before we hit the road and this year I'm going to try one of these yummy breakfast casseroles! And while you're planning that delicious meal, don't forget the other details! Check out these great ideas from Indy with Kids for centerpieces kids can make! 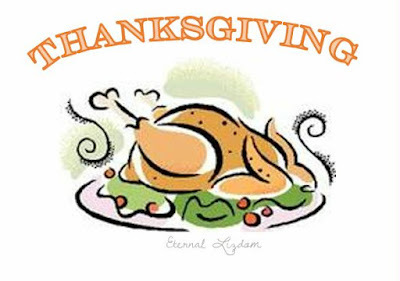 Don't mis sout on this great round up of Thanksgiving posts from The Queen of Free! It can be very tempting and easy to break the bank when planning your big family meal. The Queen has tips on avoiding that downfall, helps you shop affordably, and also has some great recipes and even tips on fun things to do with the family on Turkey Day! If you have a serious love affair going on with your slow cooker and you want to utilize an army of slow cookers for you rmeal (which sounds delightful to me), don't miss the Thanksgiving round up from Recipes that Crock! I can just picture a calm kitchen with 6 crock pots going - turkey breast, mac n cheese, mashed potatoes, creamed corn or corn casserole, praline apple crisp, and pumpkin apple cinnamon cake. YUM.